Fuse marketing & IT into single platforms that promote brand and capture revenue. E-commerce has reinvented the way we browse for and purchase products and services. 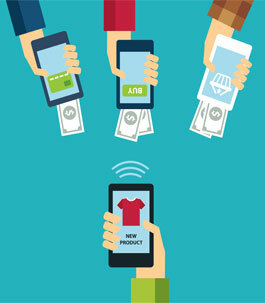 From 2011 to 2016, 15% more people will shop online, taking the total number of online shoppers to 192 million in the U.S. And analysts say that an explosion in the mobile payments market is imminent. According to eMarketer, the U.S. mobile payments market was worth $640 million in 2012. By 2016, that number will rise to $62.24 billion. With a comprehensive analysis of your sales, marketing, and IT objectives, we’ll create an e-commerce solution that allows you to capitalize on these benefits. What’s more, all front-end solutions will be fully integrated with your back-end enterprise platforms including offers, billing, contracts, third-party validation, and more.